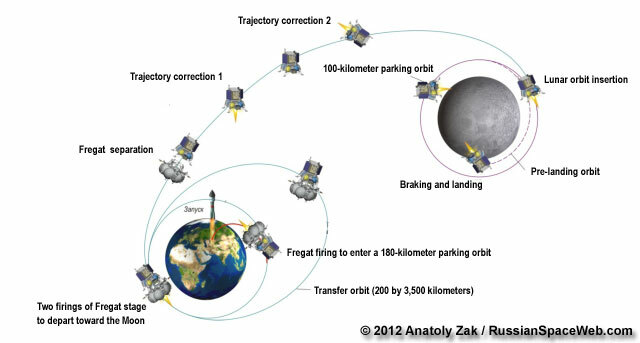 On Nov. 17, 2011, the Space Council within the Russian Academy of Sciences, RAN, formally confirmed that Luna-Glob and Luna-Resurs missions had to be split into separate landing and orbiting missions. However despite a common sense of launching an orbiter ahead of the lander, Russian planners had to go with the landing mission first. 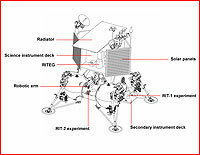 According to industry sources, by 2012, the propulsion system and tank structure for the Luna-Resurs mission already appeared in metal, along with a number of other components of the lander. However in the process of its development, the Luna-Resurs lander gained weight from the originally projected 1,275 to 1,450 kilograms, reportedly taking it beyond the capabilities of the Indian GSLV II rocket that was suppose to launch it along with an Indian-built orbiter. 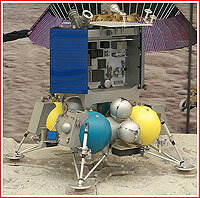 As a result, it was decided to complete the landing vehicle under the name Luna-Glob lander (a.k.a. Luna-Glob-1 or Luna-25) and launch it separately on a Soyuz-2/Fregat rocket in November 2015 or in the summer of 2016. The manufacturing of the rocket for the mission was completed during 2012, according to TsSKB Progress in Samara. Luna-Glob would take off from a brand-new pad in Vostochny in the Russian Far East, the company said. In the meantime, the Indian-built Chandrayaan-2 orbiter was left to be launched on the Indian GSLV Mk.2 rocket. By the beginning of 2012, the Luna-Glob project was reverted to the preliminary design phase. As of July 2012, Russian scientists were apparently still evaluating whether to send the lander to the South Pole or to the North Pole of the Moon, however other sources predicted that the vehicle would land near the South Pole. The Luna-Glob lander would carry only minimum scientific payload with its official main goal being the testing of landing techniques. 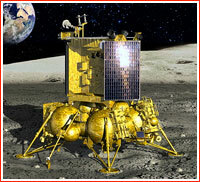 There were reports that in addition to the primary Russian-built landing system, Luna-Glob lander would also carry a European-built secondary landing control system, which could be tested during the mission. However, at least one Russian source was skeptical about the reality of reaching a workable agreement with Europe within remaining timeframe. In its initial incarnation, the landing system would enable Luna-Glob to touch down on the Moon with an accuracy of just around 30 kilometers, IKI scientist Igor Mitrofanov told RIA Novosti news agency in October 2013. According to Mitrofanov, the Boguslavsky Crater near the South Pole of the Moon was considered as a model landing site, however Russian scientists were not expected to choose the final landing site for another two years. The Boguslavsky Crater satisfied both engineering limitations of the mission and, simultaneously looked promising scientifically based on data about the concentrations of water. With a European system, which could be integrated into the follow-on Luna-Resurs mission, the landing accuracy could be improved to just three kilometers, Mitrofanov said. As of 2011, the 1,450-kilogram Luna-Glob lander would deliver around 30 kilograms of scientific instruments onto the surface of the Moon, however by October 2012, this payload was reduced to 17-19 kilograms, comparing to 34.5 kilograms onboard Luna-Resurs lander. By January 2013, around 15 instruments were expected to survive the cut. In addition to solar panels, the spacecraft was expected to feature a radio-isotope power generator, RITEG, developed at the nuclear research center in Sarov and a small robotic arm carrying scientific instruments. The spacecraft was expected to survive on the surface of the Moon for at least a year. During 2014, various statements of Russian space officials promised the launch of Lunar Glob between 2017 and 2019. In October, TASS news agency quoted Martynov as saying that NPO Lavochkin was building a mockup of the spacecraft. A development mockup of the probe's antenna had already been built, Martynov said. A series of tests were planned in 2015, followed by the launch in 2017.